London, UK (December 15, 2015) – Monumental Parliamentary history has been brought to life using audio-visual technology in the new and highly captivating Parliamentary Education Centre. Electrosonic was responsible for the AV design and systems integration for the ‘Discovery Space’, located near the Palace of Westminster, London. 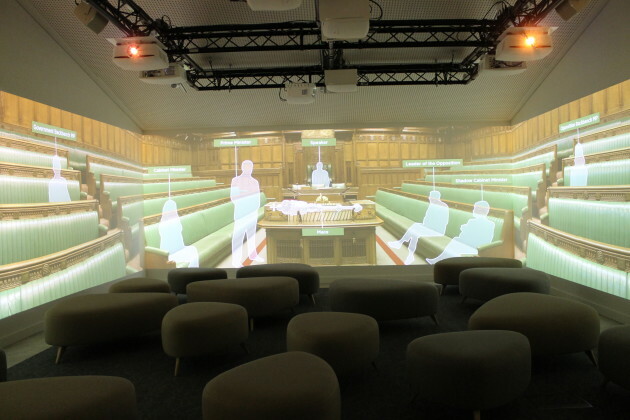 The centre, designed to connect young people with parliament and democracy, utilizes 360 degree projection technology to envelop students in a fast-paced experience that blends engaging content with spectacular visuals. Four Optoma projectors were ceiling mounted to facilitate the continuous video display around the walls, giving students a real feeling of actually being part of political history. Electrosonic worked alongside Centrescreen for the visual content, which included a memorable and visually vibrant 15-minute production where historical events connected to each Chamber are depicted. To ensure that all audiences ranging from key stage two to five respond positively to the show’s core messages, two versions of the film were created with differing levels of visual intensity and the language used. When entering the room, the desired show can be selected simply via an iPad.